15 reasons to definitely not date a comedian. Show day is always stressful as hell. And weirdly I don’t mind it so much. Today began with reading my set over for the millionth time. 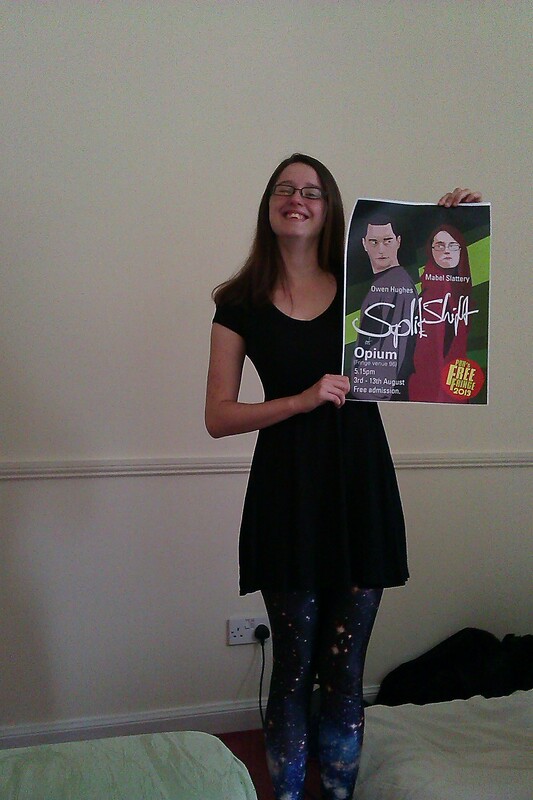 We also picked up our flyers and printed our posters, which I must say look AMAZING. Our designer Lee Martin did a really good job and I’m so grateful to him for it. I was up at 5 this morning… and my poor mother was out of the house driving me to the station at 6. A bit of rushing was involved but I got on the train and commenced my horrendously long journey. TEN HOURS. That’s too long to be doing any one thing, let alone sitting in one spot. However, I did have Dan on the train with me from Plymouth, and more importantly I had music and Minecraft – I built an ice palace! …. and I reeeeeaalllly need to sort out my priorities. I did do other, more useful things as well, bit of writing, updating my CV. I had brought a book for my uni course but, in my usual style, as soon as I have to read something, even if it’s something I like, I will do something else. Like build an elaborate palace of ice and marble in a fictional lego-style universe. The moment I saw that he was playing in Exeter I was on the phone to my friend. Despite such a reaction, he did agree to book the tickets right away – with Daniel Kitson you cannot wait even a second, otherwise everything will be sold out. This was no different: when we arrived in the Phoenix’s auditorium – a perfectly sized room of around 200 seats – it quickly filled to the gunnels and rang with an excited hum of anticipation which fizzed all the way up my body from my toes. Oh yeah. It has begun. Well in perfect honesty it began a good while ago but most of the work was not being done by me. See, I have Owen, and though living together again (even if it’s only for three weeks) could be interesting, he is much better at dealing with all the actually important stuff than I am, meaning my job basically just consists of giving him money, turning up and saying things into the microphone provided. That is as far as my responsibility should ever go, I think.